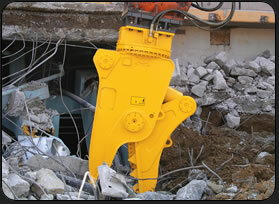 Produced with increased power and durability by state-of-the-art technology, Magnum Pulverizers have been designed for both primary demolition work, secondary concrete reduction and material sorting. The RHC Series of Magnum Pulverizers come in three different excavator sizes and are available with 360° hydraulic rotation. With its wider jaw, exceptional closing force and short cycle times, the RHC pulverizer provides excellent productivity in concrete reduction and reinforced steel separation. Increased durability has been achieved with the use of abrasive-resistant materials. Advanced design and construction produces a powerful and durable attachment to handle the toughest jobs. Cutting torch operations are eliminated by high strength steel blades mounted in the throat of the pulverizer. The RHC 516, RHC 522 and RHC 532 are available with a large diameter top mounted 360° rotator.